Pencils so soft they won't pull the eye's delicate skin. Natural pigments give you long-lasting color that stays put. Creamy and easy to apply for a perfectly lined eye. Made with conditioning oils and waxes and colored with our same protective pigments. Available in: Taupe, Black/Brown, Basic Brown, Black/Grey, Midnight Blue, Basic Black. Gently press the tip of the Eye Pencil to the upper and/or lower lash line, and apply across the lash line as desired. 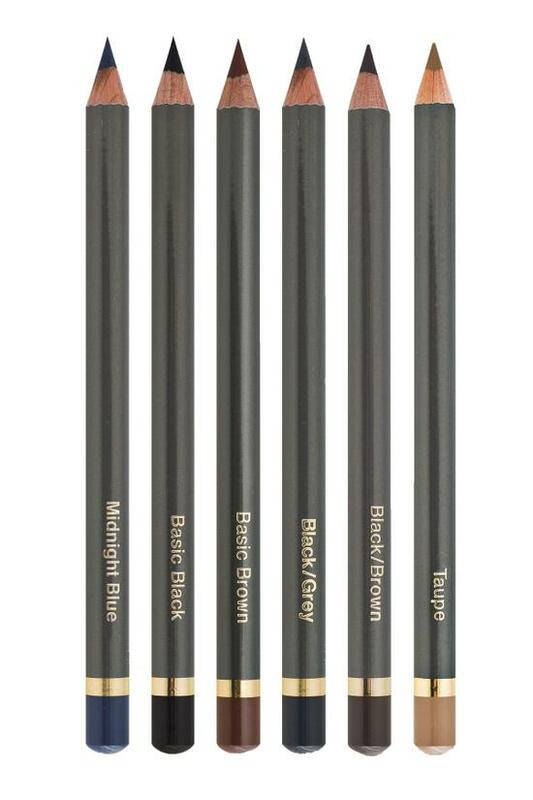 Eye Pencil all shades except Midnight Blue Ingredients: Hydrogenated Jojoba Oil, Caprylic/Capric Triglyceride, Silica, Limnanthes Alba (Meadowfoam) Seed Oil, Mangifera Indica (Mango) Seed Oil, Euphorbia Cerifera (Candelilla) Wax, Butyrospermum Parkii (Shea Butter), Macadamia Ternifolia Seed Oil, Copernicia Cerifera Cera, Tocopherol, Ascorbyl Palmitate. [+/- (May Contain) Iron Oxides (Ci 77491, Ci 77492, Ci 77499), Titanium Dioxide (Ci 77891), Manganese Violet (Ci 77742), Mica] Eye Pencil Midnight Blue Ingredients: Hydrogenated Jojoba Oil, Caprylic/Capric Triglyceride, Limnanthes Alba (Meadowfoam) Seed Oil, Hydrogenated Cottonseed Oil, Mangifera Indica (Mango) Seed Oil, Euphorbia Cerifera (Candelilla) Wax, Glyceryl Caprylate, Copernicia Cerifera Cera, Macadamia Ternifolia Seed Oil, Tocopherol, Chamomilla Recutita (Matricaria) Flower Extract, Ascorbyl Palmitate. [+/- (May Contain) Titanium Dioxide (Ci 77891), Iron Oxides (Ci 77491, Ci 77492, Ci 77499), Mica, Ultramarines (Ci 77007)].